SO WHAT IS NEW SINCE THE SNOWRUN BACK IN FEB 2013? - LOADS! 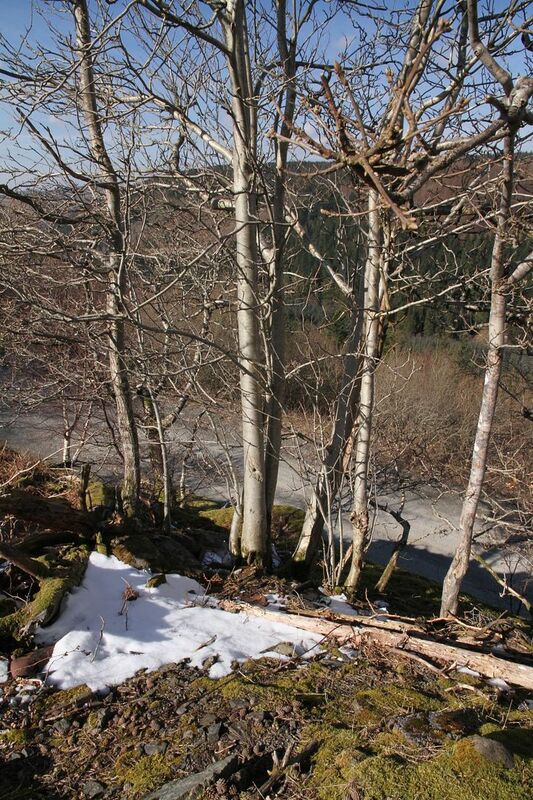 So the year so far has been a bit of a shocker – for the weather and for me. I had an ok start to the year with a few good days at Enduroland and a slippery day out at ashdown farm where I tried out Steve’s gopro. With the new gopro 3 and its narrow field of filming coming out I decided to jump onto the gopro bandwagon and buy a top of the range ‘black’ version. 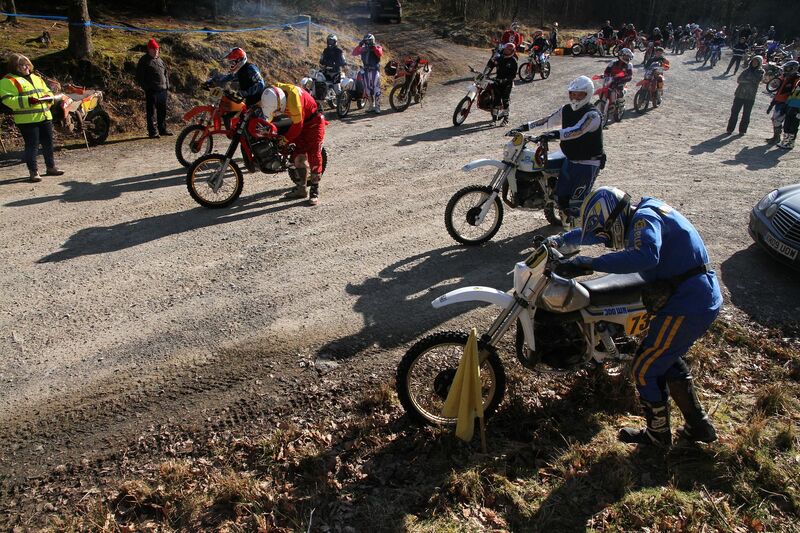 One of the first times out on it was when Tony and I visited ashdown farm’s mx track again. Of course it was still slippery but the bike was great in the conditions and I’ve sort of got dialled into it now. I put in a good few laps and when tony and I met up in the pits again he said he was going to practice a few power spin turns (didn’t know he wasn’t able to do them) and some vertical wheelie turns!? This seemed like too good a thing to miss (filming) so I grabbed my Samsung S3 and filmed him while he tried to lift up the front. I managed to film his sad attempts (sorry Tony) despite me giggling like a schoolgirl. The one attempt the front wheel came up was enough to scare him into trying the spin turns...... and while there were a good couple of ‘nearly moments’ he didn’t actually hit the deck, nope that was reserved for me later! 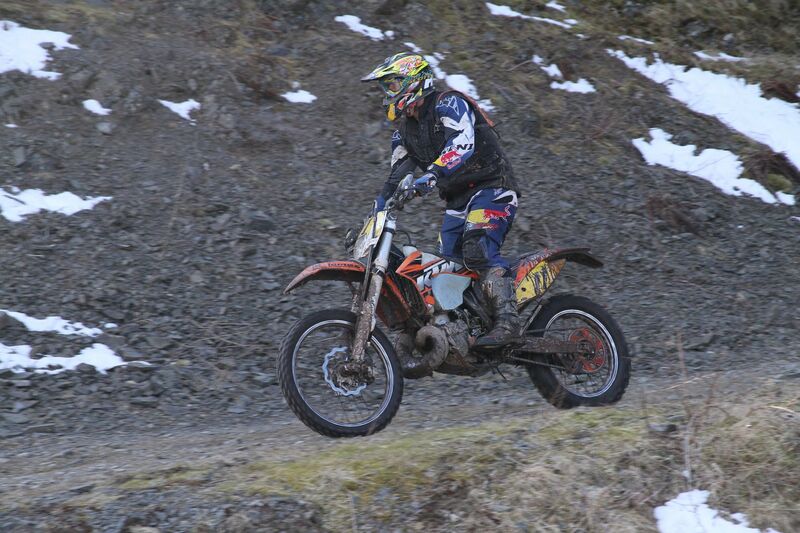 Tony tries to get some practice in doing spin turns (fair enough) - then says he want to try wheelie 90' turns EH?! Back in the pits I rigged up the gopro and set off filming a couple of quick laps, overtaking Tony and then waiting for him round the track to ambush him again when he came round. 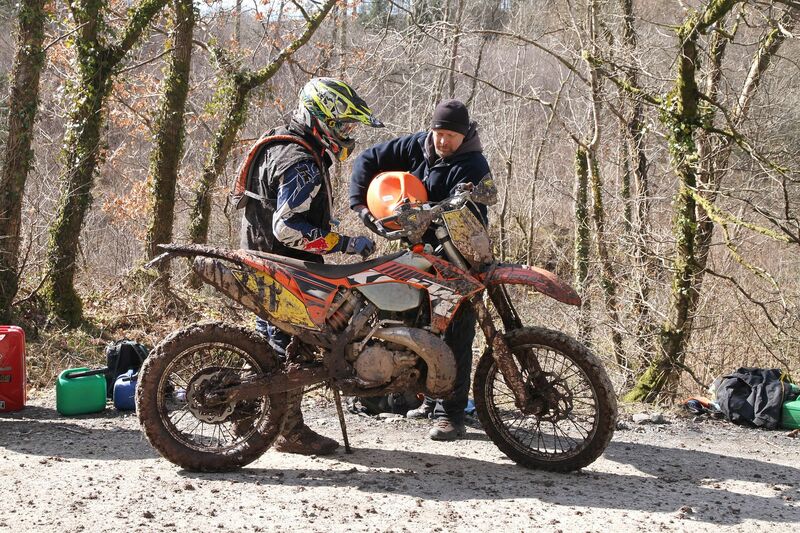 This was great fun and I was having a good time but when I was catching other riders the mud being flung up by their back tyres was a real problem. On one such a lap I caught up to a slower rider on the big downhill section on the open going and he sped up a bit so I was looking for a way past and he went wide just after the mini jump and I kept it tight to go up his inside on the left. Unfortunately he moved over to the left and I had nowhere to go and had to hit the brakes – right on a slippery patch of clay/chalk. The front washed out and I hit the deck even before I had time to attempt a save. It was a hard hit and I slide for quite a while as its downhill at this point. I jumped up to give everyone the ‘thumbs up’ that I was ok then picked the bike up and pushed it off the track so I could regain my composure. I limped the bike back to the pit to straighten out the bars and steering and then noticed my brand new grips on the left hand bar were totalled. My leg was very painful but I’ve always advocated ‘riding an injury off’ so I got back out there and put some more laps in. The only good thing was that it was at least caught on camera. Filming some more laps I tried to catch Tony at the big climb as my 2T 250 was killing his bike up the steep slope and it’s a good indication just how much more power & (strangely enough) grip the 2T has over the 4T big bore 250. Finished for the day we packed up and I was struck with another bought of coughing which I can only assume is some form of exercise induced asthma (self diagnosed via internet) that I get when I push myself too hard on the bike. The next day I was feeling a little under the weather and struggling to walk but when into work anyway but later that night I was hit with extreme chills and ended up going home early to spend the rest of the week in bed with a chest infection that had me coughing and sweating buckets all week. The leg felt great though by the second day so not all bad! Some video footage of me hammering around ashdown farm - and hamemring my head into the ground too! Two weeks later and I thought I’d pop over to Enduroland again, this time at the newer Edgehill track. I’ve ridden it once before and enjoyed it and while it’s a bit more of a technical track it’s not too hard. 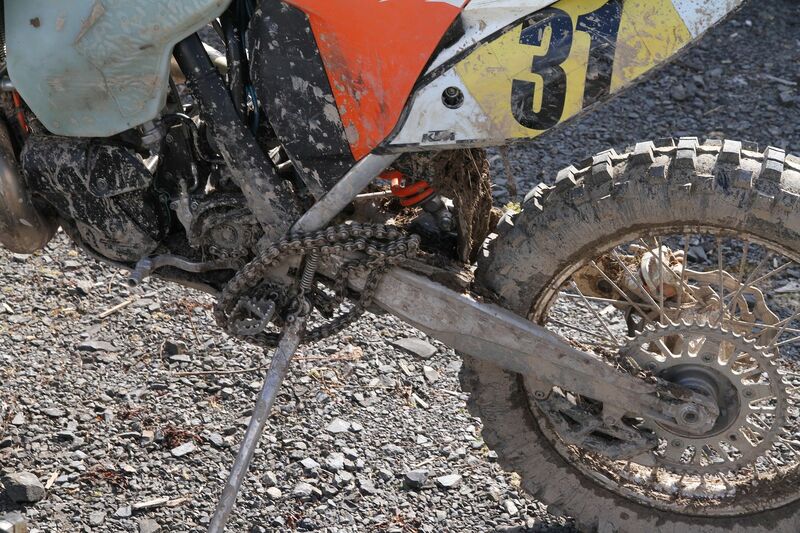 What I didn’t like was the little puddle of oil under the front fork of the ktm. Mmm a bit of dirt caught under the seal maybe? I didn’t want to go too mad as I was still not feeling 100% but I had a great day and shot some more footage on the gopro. The day went well with the bike once again flattering my riding and the only hiccup all day was a tumble at the top of a climb that I took a little tight and caught the front brake lever on a branch in a bush. This stopped me dead and toppled the bike over, luckily at the top of the climb so I was able to just pick it up and continue. Being a sandy track it didn’t take too long to wash the bike on the Monday and I decided to take a the remaining few day of my holidays to visit my sister in Hereford – where Nicky caught a cold off of her and promptly gave it to me too! Not serious at all but enough to put paid to any ideas of getting some more racing (or training) under my belt. 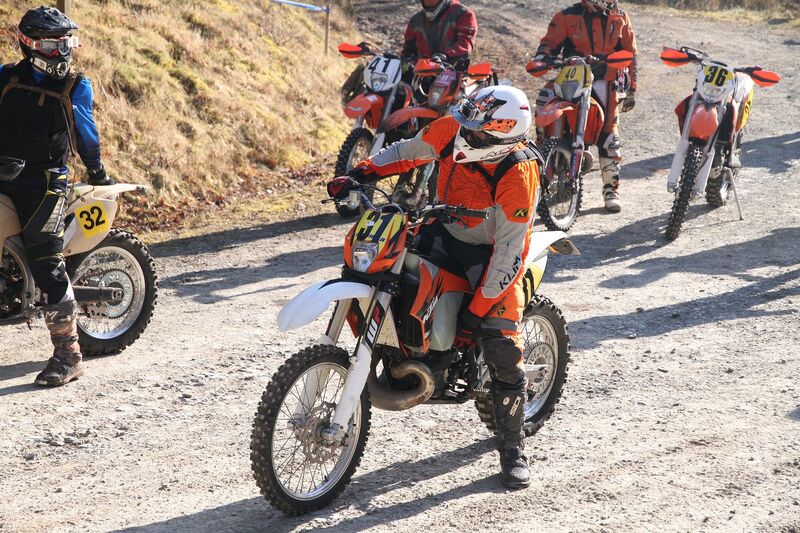 So another couple of weeks off and then it was the first Open Day with the Chiltern Hills Enduro club on the 24th of March. But first I had to fix the leaky front fork on the 250. It had leaked out again when parked up in the garage, so I took it out and ran a feeler gauge all round the inside of the seal. This cleans the dirt out and normally cures the leak. Once it was cleaned up I pressed down on it several times but it seem to be ok so I compressed it a little and propped it under the back of the tenere and left it for an hour or so, still no leaks, great. But then I started worrying about the amount of oil that could have leaked out and I decided to buy the ktm multi tool that you use to strips the forks down. I ordered the bit from the KTM Centre in Hemel and picked it up in a couple of days. Having watched the video on Slaven’s Racing website it looked very easy to do and I was pleasantly surprised just how easy it was to strip the forks down to drain the oil and clean it up. This was going to be easy, why didn’t I do this myself before? I was checking everything out when I got distracted and the spring fell out the tube I was holding. Cursing how stupid I was I had a look around for any missing bits then cleaned everything up and left them to drain while I had dinner. Later on I popped everything back together and filled it with oil then fitted it back on the bike - then took it off again so I could fit the fork guards as they have to slide on from the top. Looking at the colour of the oil I started feeling guilty that I’d only done one side and seeing as it was so easy to do I pulled the other one off and quickly stripped it down for draining. Hang on where did this plastic spacer come from? Ah crap it looks like I lost a part when the spring went flying. Out with the LED lead lamp and sure enough hiding behind the wheel of the 450 was a little plastic washer. Ok fork back off, drain clean oil into container, pull apart and fit errant washer, put oil back in and rebuild again. Great now just fit back to bike (doh) remove again to fit f**king fork guard and job done. Ok one more to go. This one went amazingly easy and smoothly and I actually remembered to fit the guard this time before putting it back on the bike! The CHEC club laid out a great track in the woods of Moor Farm at Lane End but the cold arctic like conditions kept the numbers down a little, it was -3 on the car’s dash when I was driving over to the venue. I was the only one from our regular group that made it, but a couple of riders came over to chat and as I find it easy enough to talk to others, so I wasn’t totally alone, sniff. Anyway like I said it was a great track and again the bike felt like it was on rails so the slippery conditions were fun for me and I put in a lot of laps and filmed a few too. It was a bit tough for some I think and quite a lot of guys left early due to the cold and slippery nature of the track I think. It was a nice long lap but due to the lack of other riders in the film it’s a bit boring I think. Still if you’ve nothing else on, it’s worth a look. Cold? I'll say! Don't let the sunlight fool you! So this brings me to this last weekend and the Drovers Enduro. 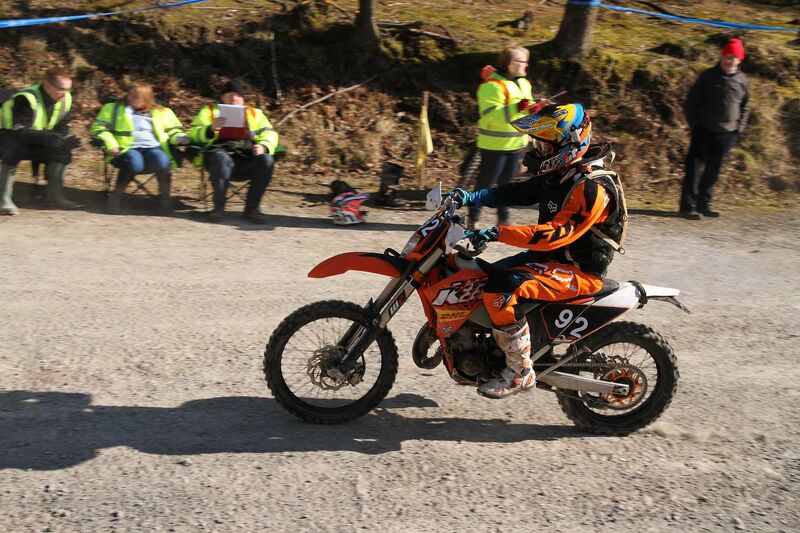 I seem to be having a bit of a love hate relationship with Welsh enduros. Either I go really well or I have a nightmare, with no middle ground. Having left things to the last minute again it was a bit of a rush getting everything sorted in time, not least getting the car though its MOT by having to strip out most of the interior trim to run a wire from the fog light (in the boot lid) to the trailer socket (new mot rules). Driving over to the venue the temperature was sitting at -5 and the thought of getting undressed in that wasn’t something I was looking forward to. We turned off the A40 onto the forest track to get to the venue but pulled over for a quick pee stop. I then noticed the trailer hook plastic cap still sitting on the boot of the car, frozen in place by the water I’d used to clear the back window when hooking up the trailer at my sisters place the morning! Wow I thought, today is my lucky day, but then a little voice said “ah yes but maybe you’ve just used it up for today” which one was going to be correct? I kept a spot for Darren and his son George and we did all the usual pre race things i.e. sorting out times, talking petrol and gear to the pits etc. Darren was number eleven and I was a few minutes back, starting in position thirty one. I eyed up the completion on my starting line-up and got the jump on them for the first run up the fire roads, down through the gully, across the stream (where I got wet feet and the bike was still cold so bogged a little when I tried to lift the front end up to clear the water) and up into the forest. Once into the forest proper, the going slowed down a lot and I picked my way carefully across the roots and sticks sitting at angles to the track. I was a little too cautious I think as number thirty two overtook me but I resisted the urge to go too hard and kept my pace steady. I think this was the right tactic as I overtook old thirty two several times, as he was pushing too hard and crashing a lot. We got to the first check with about three minutes to spare and I was held up a bit by a rider in front who dropped his timecard. 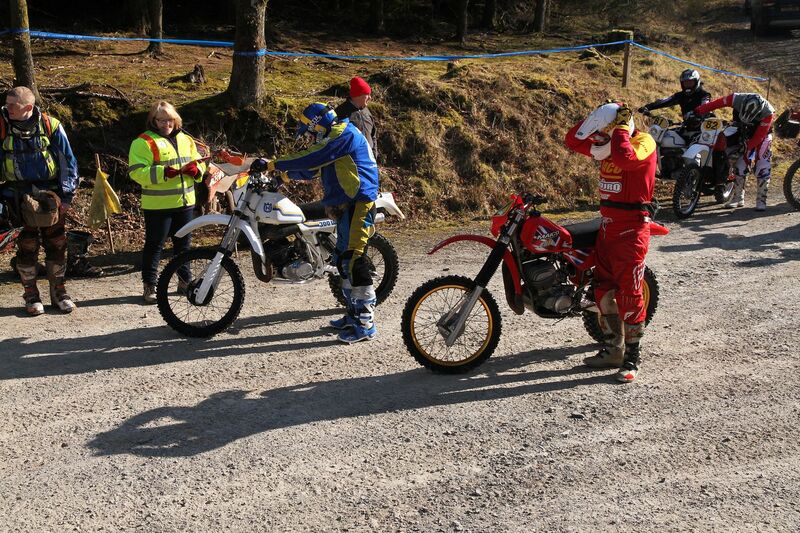 Anyway I got going and straight after the check the start of the timed special stage set up. Being the first lap it’s not timed so we rolled on through the lights and tackled the slope that makes up the first section of the test. I caught up to and overtook one rider, then got stuck behind another. With my view up ahead blocked I picked the wrong rut, it was deep, very deep so I knew I needed some speed to clear the boggy bit coming up. I gunned the bike and I shot forward then with clank stopped dead. Looking down I couldn't see what was wrong so I opened it up again only for a slow chugga chagga sound to come from the engine. I wiped in the clutch override and nailed the engine to full revs and dumped it to clear whatever was holding the wheel only for it to die. 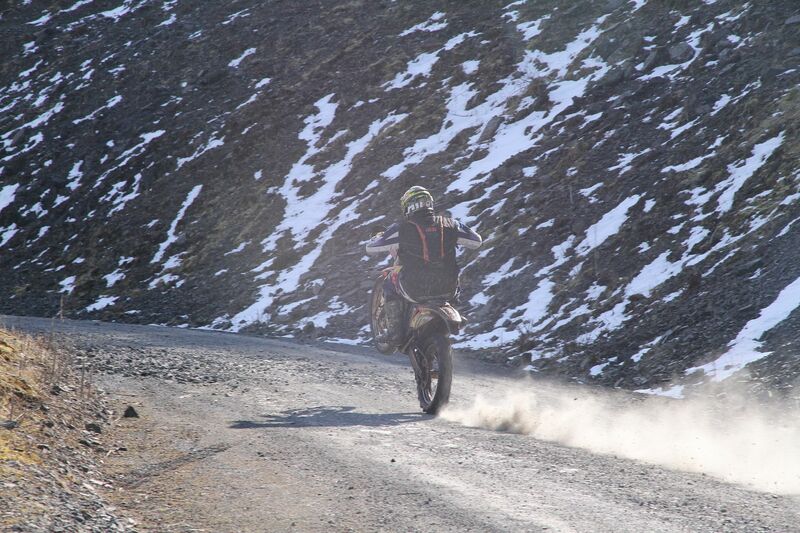 I tried this a couple more times then jumped off to pick the bike up and out of the rut. It was then that I noticed the chain wasn’t on the back sprocket. Oh crap! I dragged it to one side and propped the bars against a tree and set about trying to free the chain that had been sucked up into the front sprocket, doubled up against the swingarm and sprocket. some of the classic bikes start easier than the others! I was kneeling down working on the bike and another bike came past and threw its chain off too but I think Bob stopped the rider getting it too mangled and he carried on. Another bike got stuck and spun up the rear showering me in high speed mud projectiles and a particularly large clump smacked my in the back of the neck. I took off the rear chain guide to get some slack and jumped up and down on the chain but it wasn’t going to budge and another rider came past clipping the bars of my bike, sending it flying. Bob from Enduronews was there and he suggested splitting the chain by the spring clip and said he’d give me a tow back to the pits once all the riders had made it through the spot. I helped several riders extract their bikes from the deep ruts as they were deeper than wheel depth by now with rock hard edges. The rut where my chain came off was as hard as solid rock itself so I can only assume that this had caused it to jump off somehow as I checked the tension the day before when I fitted a new tyre. 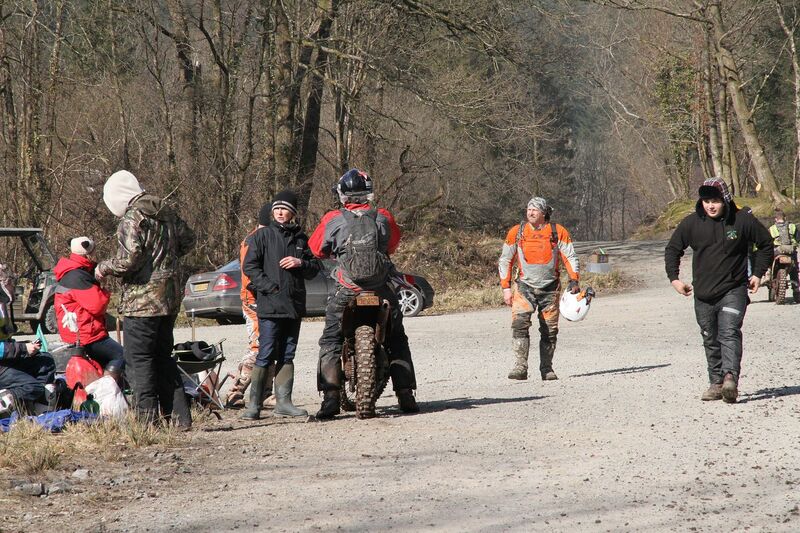 Half way back to the pits we stopped for a chat with two marshals and one of their bikes had also suffered the same fate. nice sunny weather - what's that white stuff? 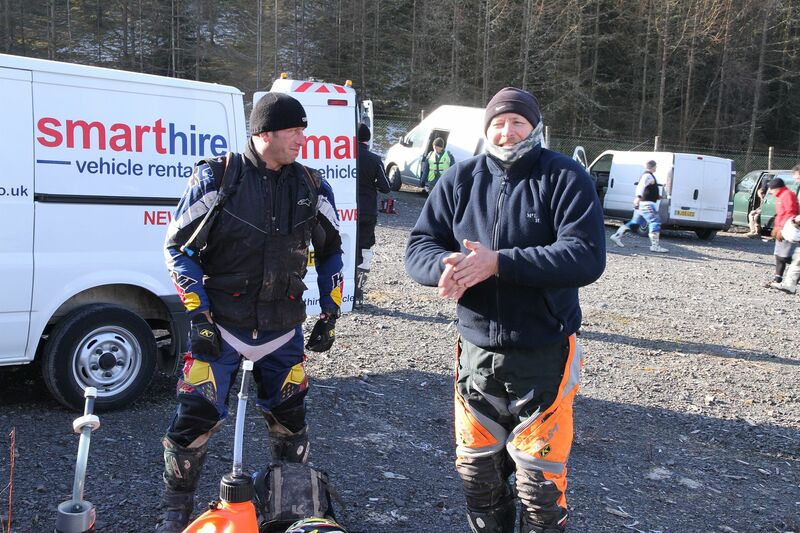 Back at the pits I parked the bike and hurried up to the pits as I knew Nicky would be worried I’d not come round. After explaining to her what had happened she took me too a little stream where some nice ice formations had formed and she wanted to take some shots. After getting packed and changed I went up to see if Darren needed any help refuelling. He came in cutting it close on time and I topped up the tank a little. I asked how he was getting on and he said he was "bloody knackered" and had fallen off "at least a dozen times"! the cause of the problem! I wished Darren luck as he left then went to hand in my timecard, jumped in the car and tucked into plenty of food on the way back to my sisters. Another terrible result for me, which is a pity as I was enjoying it up until then, and was hoping for a good result. Sms’ing Darren on Tuesday once the results were out I then found out that he had the same problem as me (chain caught in front sprocket) on the last lap and lost a lot of time, incurring loads of penalty points, but a least he finished. George managed two of the three laps in the sportsman class and called it a day. 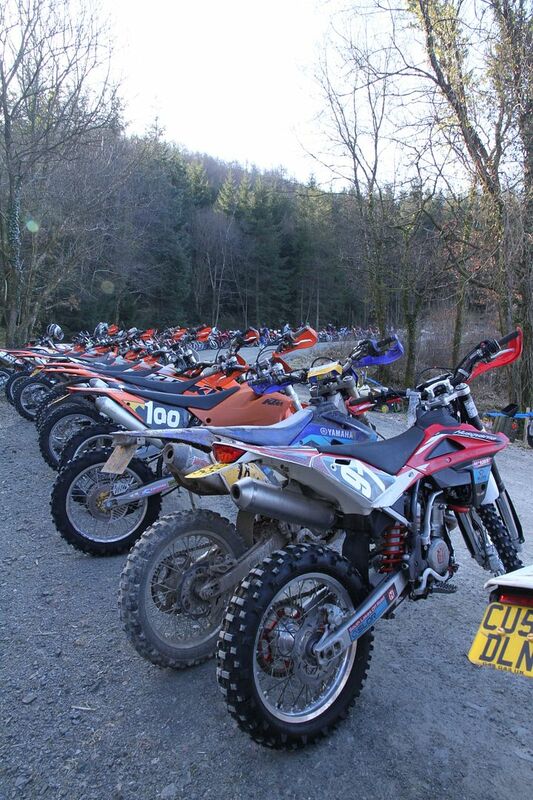 So once more the Welsh mountains kicked our butts, but we’ll be back for more next year! I was so looking forward to the 7th of April at Houghton Conquest. Enduroland are regular visitors there but it’s rare that you get to ride the whole venue due to farm restrictions but this time they had access to everything so laid out an extra long track taking in all the best bits. Most of the regulars were there and we managed to park up in one little group. I knew it would be a popular event so got there early to secure a parking spot in the top field. First up was the mini race i.e. 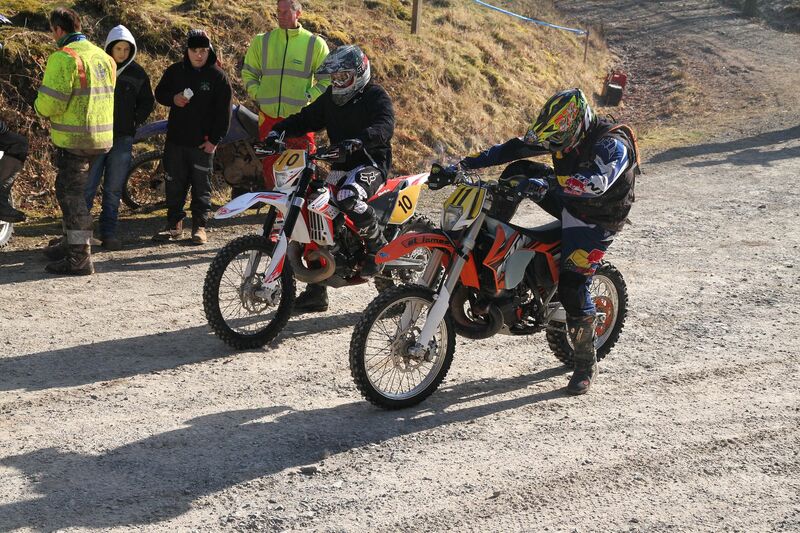 the Holeshot hot lap that had a winner takes all £250 prise fund. This time it was with a Le Mans type start and seeing 16 guys thunder up the hill towards their bikes (some quicker than others) was quite a laugh. One rider got a clear lead from the start and I was convinced no one would catch him but a rider in bright red gear found a bit of speed from somewhere and came home the winner, even though he was not one of the first bikes away. I let the main pack set of on the sighting lap then followed after a bit. I never had my GoPro on, but I wish I did now as riders were going down all over the place as there were a lot of cambered hills and turns to catch anyone out not going quick enough. I was surprised just how long the lap was and it was also quite tiring, one because of all the downhill’s and two the amount of woods riding. The track was constant work with only two or three throttle wide open spurts. The track ran in the traditional direction but the bank on the RHS was divided into two main sections and only the first part was ridden initially with the second part tackled once you’d gone though some woods. A few of the slopes were similar to previous tracks but the majority were jiggled around so you had to keep your wits about you to stop yourself shooting off in the wrong direction i.e. following old familiar tracks. After a couple of laps I got the GoPro out to do a little filming. On the second run I teamed up with a couple of the guys to make it a bit more interesting and I set off last to film. The front rider was pulling away a bit as I sat behind waiting for a good spot to attempt and overtake when I got handed one on a plate – or more to the point the bike did – by doing the “fuel injection stall” dance as it was braking hard into a tight bend. I nipped past and set off after the next victim I mean rider… and it wasn’t long before I was on his tail and again looking/waiting for an opportunity to overtake. I slipped past at some point (slower rider got in the way) and kept up the pace through the trees but turned the wrong way at one point as someone had knocked the tape down (again) and I skipped a short bit of the woods out. I pulled over and contemplated going back to fix the tape but the other two made exactly the same mistake as me so I decided to crack on and get it on the next lap. We flew into the woods with me bringing up the rear again and once out of the woods another mistake handed me a chance to slip into the middle again but this time I wasn’t able to get past the lead rider despite looking for an opportunity. About halfway through the day I went out on Steve’s new 350 burg. In the pits the front felt a bit soft so I wacked it up about six clicks at least then headed out again to see what it would do. 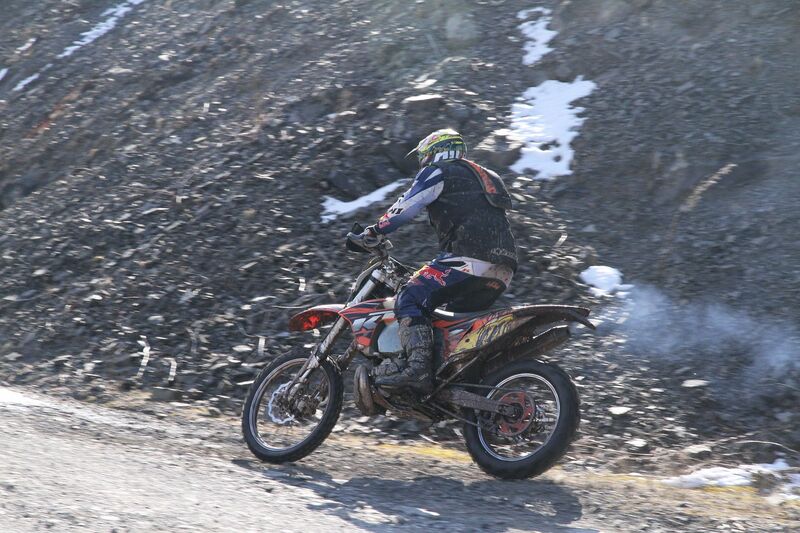 Without a left hand rear brake it was always going to be hard for me to match my speed on the ktm but I must say I was VERY impressed with the 350. Handling was great with no issues and felt very planted over all terrain i.e. hills steep drops and rough going both slow and flat out. The engine is great and I can see why so many people get on so well with them. It pulls out of turns and you have that nice long overrun that you just don’t get with a 2T bike. I must admit that at one point I was thinking I might have made a mistake getting a stroker – then it stalled. Yep the bloody fuel injection on these things works great, as long as you are not braking hard into a tight turn from being hard on the gas. Not only do these new injected bikes stall (several of the others were doing it too) but they don’t like to fire up too easy either so I was left there cranking the bike over in the middle of the track – at least four times in one lap. Ok I’ll concede some of it was down to me but it spoilt an otherwise near perfect bike. When I got into the pits Steve was there and I rode up and the first thing I said was “man if this thing didn’t stall and had a Rekluse with a left hand rear brake it would be an absolute weapon”. 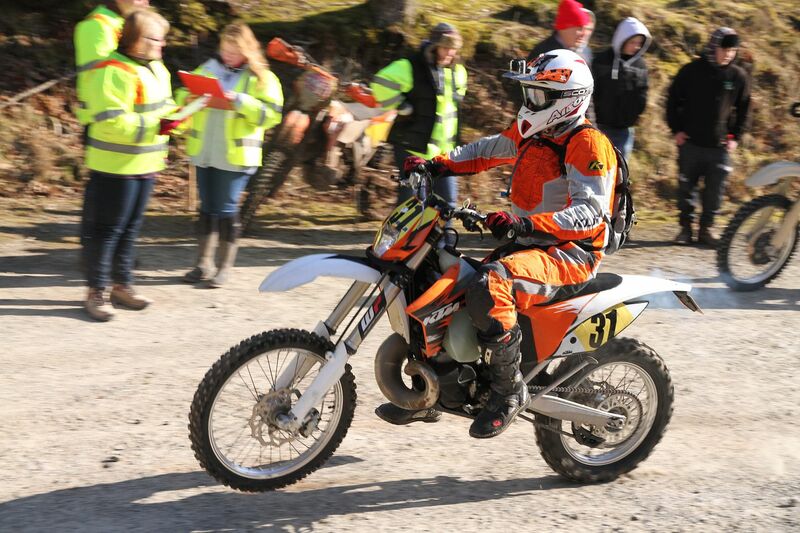 Having praised the 250 so much I was a little worried getting onto my bike as I was worried I might be getting second thoughts – then I rode it again and suddenly realised I had nothing to worry about. I still stand by my statement that the 2011 250 XC with the mods I have on it is quite simply the best bike I’ve ever ridden bar none.